This Glenwood Canyon rock slide has closed Interstate 70 since Monday (CDOT photo). Interstate 70 — one of the nation’s main east-west highways for commercial truck traffic and the primary connection between Vail and Aspen ski areas — remains entirely closed to vehicle traffic Thursday morning after a massive Glenwood Canyon rock slide on Monday that damaged two tractor-trailer trucks but caused no injuries. 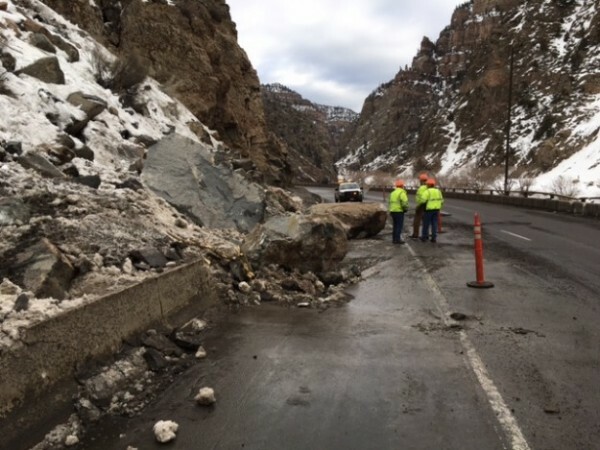 Colorado Department of Transportation officials have been working all week to bring down any additional rocks, clean off I-70, repair the road and get at least one lane of alternating traffic open to the public. Meanwhile, alternative routes between Eagle and Garfield counties — and what used to be an easy half-hour trip — now take up to four hours or more. GARFIELD COUNTY – While CDOT still hopes to open the highway Thursday afternoon (Feb. 18) to single-lane, alternating traffic, this is not a certainty at this point. Rock scaling operations continued Wednesday in Glenwood Canyon, bringing significantly more debris down from the slope than originally anticipated. Rockfall crews are continuing to stabilize the slope and rockfall mitigation fencing will be installed on top of the westbound barrier walls. Crews will also be working to remove the damaged wall and guardrail in the westbound lanes. In the meantime, crews will be ready to implement single-lane, alternating traffic control if it is determined the site is safe for travel. Once implemented, the pilot car configuration will run about six miles with traffic being staged on the east side of Hanging Lake Tunnel and the crossover will be at the Grizzly Creek rest area. The Grizzly Creek, Hanging Lake and Shoshone rest areas will be closed during the duration of the pilot car operation. Bair Ranch and No Name rest areas will remain open. Motorists should expect at least an hour delay getting through the canyon during the pilot car operation. As repairs progress, CDOT will move to open one lane in each direction. It could be several weeks before the damage to the roadway walls and roadway are repaired and the interstate is fully open to regular traffic operations. Colorado Department of Transportation crews were able to flag traffic throughout the day on Monday when the rockfall incident started at 2:30 a.m. A second slide incident in the same location (mile point 124.2, directly west of Hanging Lake Tunnel and eight miles east of Glenwood Springs) occurred at 9:03 p.m. Monday, February 15. At 10:07 p.m. Monday night, CDOT fully closed I-70 through the canyon for safety. TRAFFIC THROUGH THE CANYON – The average daily traffic for Glenwood Canyon is around 300 vehicles per hour. Around the evening of the incident the average traffic was about 150 per hour; the volume starts to drop off significantly after 11:00 p.m. to less than 100 vehicles per hour. TRAVEL IMPACTS/ALTERNATE ROUTE: There are two alternate routes, one north of I-70 and one south of I-70. The north alternate route for for westbound motorists is north on CO 131 at Wolcott to Steamboat Springs, west on US 40 to Craig, then south on CO 13 to Rifle and back to I-70. This is a 203-mile alternate route that will take about three hours and 50 minutes to travel. This detour adds 146 miles and about three hours to a regular trip from Wolcott to Rifle on I-70, which is 67 miles or about 45 minutes. Please always check www.cotrip.org for roadway conditions before heading out. Cottonwood Pass and Independence Pass are both closed and not available as alternate routes. Frying Pan Road and Hagerman Pass are not recommended alternate routes. BUSTANG SERVICE: In addition, the western terminus for Bustang, CDOT’s interregional express bus service to Glenwood Springs, is being temporarily moved to Eagle while I-70 is closed through Glenwood Canyon. The current arrival and departure times will remain the same. When I-70 reopens to traffic, Bustang will resume regular service to Glenwood Springs with possible adjustments to the arrival and departure times pending the pilot car impacts. SIGN UP FOR CDOT ALERTS: If you are interested in receiving CDOT project and/or lane closure notifications to your email or mobile device, please sign up at www.codot.gov and choose the envelope icon at the bottom of the page.